Jack Clevenger’s moment of truth will hopefully soon get the focus it deserves. When it opened last Saturday, Oregon Children’s Theater’s Storm In The Barn had already whipped up a lot of interest, in large part by combining some of this town’s favorite fetishes: old-timey rock bands, comicbook culture, and rejuvenile -style whimsy in the form of puppetry flourishes. “This is the most adult crowd I’ve ever seen here,” quipped an OCT volunteer at the 2pm matinee as hip soundtrack composers Black Prairie and comic book author Matt Phelan attracted a swarm of other full-grown Americana fans, á la Nick Jaina, to the latest cool kids’ play. “If you could see the love that went into this…!” gushed artistic director Stan Foote—and we could. Tasteful theatrical trappings and incredibly agile performances made Storm ‘s stage debut a sensory delight with only a few shortcomings. As the run continues, we’re rooting for this homegrown play to flourish as fervently the Okies prayed for rain. Multi-tasking. Contrary to Culturephile’s assumption, Black Prairie does not play the soundtrack live—nor is it piped in. The actors themselves do the music-making, brandishing everything from banjos to percussive tin cups, while maintaining character. Their talents and their dexterity are truly amazing, as is the beautiful and varied music they manage to play almost effortlessly while acting. Arrangement Sometimes the music chimes in one instrument at a time, taking its cues from dialogue to gradually build a mood—and stopping on a dime when a speaker takes a pause. Other times, it bursts into a sudden rumble during a fitful action sequence. And sometimes, it uses STOMP stylings with all-hands-on-deck drum circles in which washboards, pitchforks, and skillets find their voice. Sometimes humming a ghostly melody as Ma, Musical director Melanie Joy Hall brings a facile theatrical touch to Black Prairie’s creations. Scenery and Wardrobe Under a sky that changes hues from gray to orange to blue, an era-appropriate pickup truck and homespun garb seem clipped right from the photo archives. When the cast is transformed into black silhouettes in an actual dusty haze (released onto the stage for greater authenticity) they suddenly transcend individuality to create a portrait of humanity. Civic Relevance "It’s bigger than us, any of us. We’re getting swallowed and no one’s even noticing,” exclaims Ma, sounding for all the world like a subprime foreclosure victim. "When people can’t do anything, they do crazy things,” explains Doc, as if observing the “occupy” movement. An accessible entry point for a broad civics lesson, the program even provides a few notes on The Great Depression and a set of discussion-spurring questions. Puppetry The large-scale Storm King, an embodiment of the stingy rain that refuses to fall. In the capable hands of actor Damon Kupper (who also plays Pa and is a member of Third Rail) it’s disconcertingly humanoid and looming. Fireside Storytelling revival Parents fighting to fend off the modern mechanization of child entertainment might hope this play proves a good influence. “We can make our own fun!” the townfolk seem to say, swapping stories and song and even cracking into a classic, The Wizard of Oz, to keep each other smiling through tough times. Great Child actors Dual “Ralphie” (Christmas Story ) alumni Michael Cline and Jack Clevenger are already veterans, the former using his newfound larger size to help hoist staging elements. Ffive-year-old Steele Clevenger makes her debut as Mabel, adorably taking cues from her older brother. Ashley Waldbauer strikes a delicate balance of emotional strength and physical frailty as Dorothy, while Connor Delaplane contributes great guitar chops as Ray. OCT couldn’t hope for a better advertisement for their summer acting classes. Though much of the play’s quickly-elapsing hour is devoted to the main conflict (man against nature), main character Jack’s mission wasn’t particularly clear. 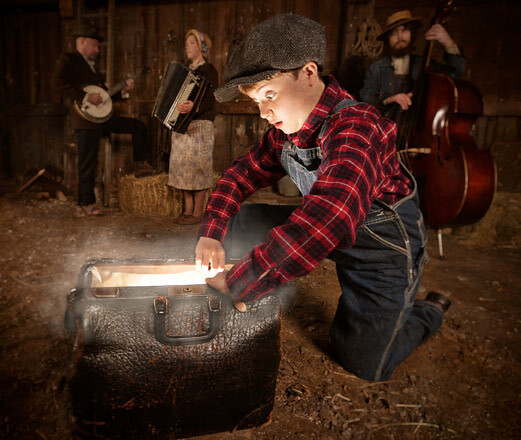 We suspect that more answers could be teased from Doc (Daniel East) during his partially-ad-libbed “milk from a stone” folk tale, or from Ma and Pa. Hopefully, Jack’s purpose will come across stronger as the play hits its stride. With musicians constantly pacing the stage, it was sometimes hard to know where to focus—especially during Jack’s heroic climax. Perhaps a more consistent and commanding use of the spotlight would direct focus where it needs to go. And quick, somebody drape a couple extra yards of black gauze to drape over the back of The Storm King’s distractingly two-dimensional head! Overall, the play has enough entertainment and lingering philosophical value to make it a worthwhile destination for parents and kids, and a decent diversion for hipsters. But to appreciate the storyline to its fullest, you’ll probably also need to read the book.